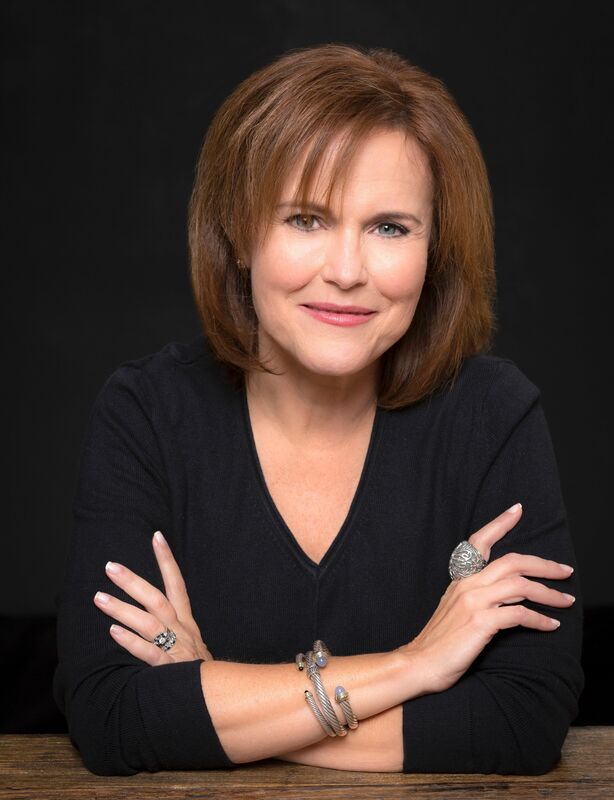 Melissa Thoma is a successful businesswoman and arts philanthropist whose contributions to the central Arkansas arts scene have spanned decades, both on the stage and behind the scenes. 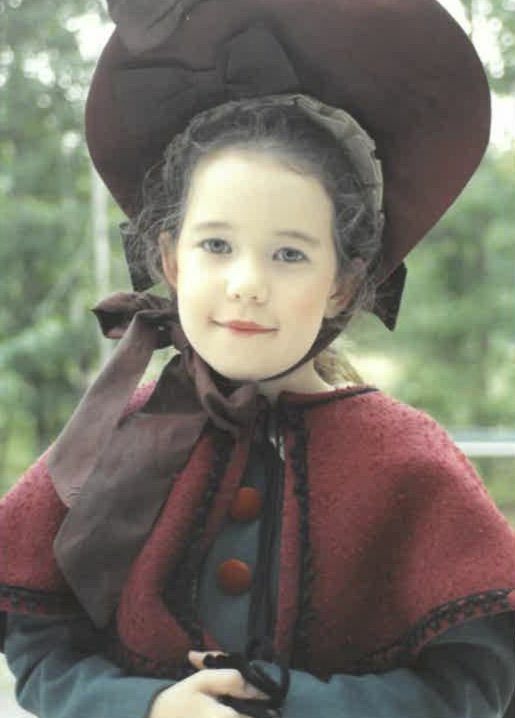 This weekend at Wildwood Park for the Arts, she returns to the Cabe Festival Theatre stage to sing the role of Cousin Hebe in Praeclara’s staging of Gilbert and Sullivan’s comic operetta, H.M.S. Pinafore. 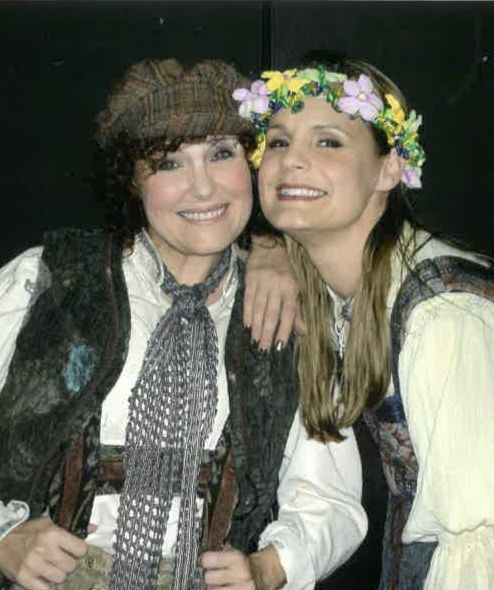 In this interview with Praeclara communications director Karen Kuralt, Thoma shares her thoughts about what makes this weekend’s show an unusual and noteworthy production of Pinafore, and she explains why both the show and Wildwood Park have always been close to her heart. This isn’t the first time H.M.S. Pinafore has been staged at Wildwood. Why is the show so popular? Yes, it’s probably the most popular of all the Gilbert and Sullivan shows, and this is the third time it’s been staged just at Wildwood alone in recent memory. There have been so many good productions around the state. Gilbert and Sullivan were really the grandfathers of British comedy, so their works feature that very dry, ironic intellectual humor and word play that we expect from the best British comedians. The show pokes fun at all the hallowed Great Britain institutions — the aristocracy, the “keep calm and carry on” attitude of the British, etc. It’s a happy melodrama that succeeds partly because it plays on the American love of British culture that’s been around since the show’s inception. What’s unique about this particular production of Pinafore ? People who love Gilbert and Sullivan think they know what to expect from the show: the Victorian England time period, women in dresses with giant bustles, the traditional wooden sailing ship. What’s genius is that Bevan Keating [the show’s director] has taken it in a new direction, making it relevant, fresh, and fun for today’s audiences. 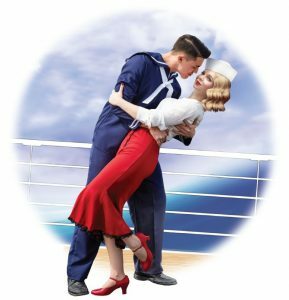 It’s set in the 1940s on a big metal freighter, which is a very different look for the show — and because it’s the 1940s, it’s the king’s navy we join, not the queen’s. You get this interesting mix of glamorous 1940s styles combined with modern inside jokes and sight gags. Almost every scene has physical comedy built in to bring the dialogue to life. The set is phenomenal, using the full expanse of the stage: height and breadth and depth. It won’t look like any set you’ve ever seen for Pinafore in the past. And there’s a lot of fun choreography! It’s not just “stand and sing,” which can happen with large casts. We’ve got swing dancing, quick steps … a kind of “shimmy-shimmy” that gives the show new exuberance and liveliness. Bevan’s clever and thoughtful editing of some of the musical numbers has also worked to create a faster-paced show than more traditional productions. How has this new setting affected your interpretation of your character, Hebe? I’ve just loved working again with Matthew Tatus [who plays the show’s admiral, Sir Joseph Porter]. 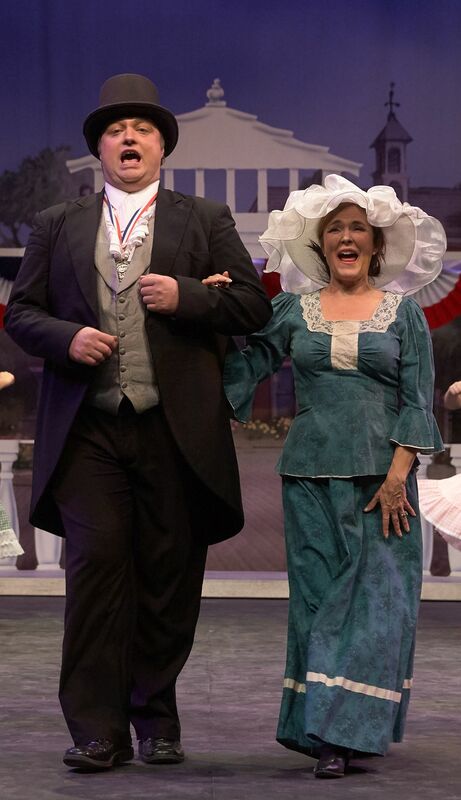 We previously worked together as the Mayor and his wife, Eulalie, in Praeclara’s production of The Music Man in 2017 [pictured at left]. I think our take on Hebe and Sir Joseph’s relationship is quite different from what people are used to seeing. That’s partly because Matt’s interpretation of Sir Joseph is so unusual. Matt plays him not as a doddering old man, nor as an idiot, nor a bore. He’s just a pampered aristocrat who is utterly convinced of his own greatness, even though he completely lacks the qualities he claims to admire. He’s out of touch, but benign. This wealthy character who is oblivious to his own privilege and his misplaced sense of liberality parallels so many social issues in Arkansas today. It takes the show from a light, foamy bit of entertainment to something we can really learn from and that is really relevant. My character, Hebe, is also noble born, and my perspective is that she goes aboard the ship intending from the start to discourage Sir Joseph from this highly inappropriate marriage to Josephine. As an aristocrat herself, Hebe deserves a man of Sir Joseph’s rank much more than Josephine does, so she can hardly wait to encourage Josephine to marry elsewhere! When love finally does erupt between Sir Joseph and Hebe in our show, it’s pretty passionate, and we’re having a great time with that. Really, everyone in the show is so well cast. Kelley Ponder is vocally perfect as Buttercup. Luke Angelo has the stars-in-his-eyes Captain Corcoran down pat. And we are lucky to have such gifted singers and performers all the way around! With Praeclara, everyone is giving everything they have; everyone has given thought to their characters and how to embody them. Tell me about some of your previous opera experience on the Wildwood stage. Well, my history stretches nearly 25 years. 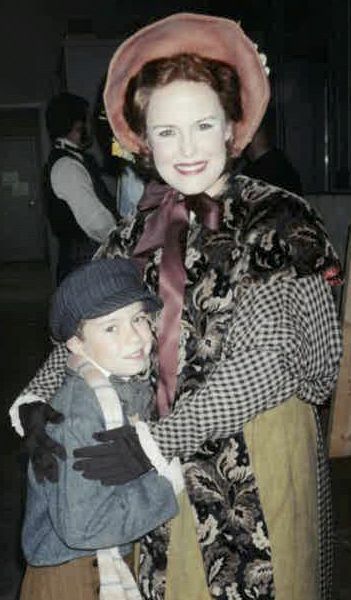 My daughter was 5 when I appeared in Madame Butterfly with Christine Donahue, and that was my first performance. I was raised in a musical family, and I fell in love with opera, operettas, and musical theatre at a young age, but I had no formal training. I was educated by working with other professionals at Wildwood as part of the Arkansas Opera Theatre Company. At first, I had just very small roles so I could develop vocally. My first leading role at Wildwood was in Hansel and Gretel, singing the role of Hansel alongside Kira Keating’s Gretel [pictured at right]. To this day, it’s one of my favorite roles because it’s the first time I was trusted with a leading role. It was vocally demanding, and it required me to play a pants role for the first time and completely disappear into that character. The first time I performed H.M.S. Pinafore at Wildwood, it was an outdoor performance on the edge of the lake. On the day of the first performance, it poured rain, and the stage became super slippery. At one point, I took a giant step forward, slipped, and fell flat on my bustle! Once something like that happens, you just lose all fear of what could go wrong on stage. It was so bad that our leads had to take off their shoes to maintain traction, and our sailors had to come out and swab the deck at intermission. Amazingly, the audience was completely undeterred. But since that time, all performances have taken place indoors! Some of my other favorite performances include two stagings of Pirates of Penzance, one in which the set was an adult-sized playground with swings, slides, and teeter-totters! I’ll never forget watching Jon Davies singing “Modern Major General” while also playing hopscotch. I also loved La Bohème and Barber of Seville, which was the last show we did with the opera theatre at full strength. In retrospect, it was just amazing to have this creative outlet to explore at such a high level while I was also running my business, raising a family, and more. How did you and your husband, Martin, become involved behind the scenes at Wildwood? Ann Chotard was the executive director for Wildwood at the time, and she wanted forge stronger connections between the board of directors and the performing experience. She was looking for people who had both business experience and a first-hand knowledge of the arts. She wanted people who knew how to combine creative vision with the business decisions that make the arts sustainable. I took on leadership roles at Wildwood at several different points, including chairing the board of directors for 6 – 8 years on and off. I learned right away how difficult it is to run a creative arts nonprofit. You share a burden of responsibility with the staff and the executive director. It gave me a chance to put into action my beliefs about how to build something for the community that will last, something that will have a vibrant future. The most challenging part is getting beyond year-to-year survival to creating a long-term, sustainable future. In central Arkansas, we have one of the most generous philanthropic communities, but our community is very small, and the same people are supporting everything. We have to understand how artistic enterprises are run and how we can capitalize on funding: grants, long-term pledges, business partnerships, educational partnerships, and other ventures that help us earn. I own a 30-year-old business, so I know how to make that run, but I learned a lot in those years about how the challenges of running an arts nonprofit are different. I asked my husband, Martin, to join us on the board at Wildwood because I felt we really needed his expertise with board governance and how to develop a strong, functional board. Martin was the board chair for the Arkansas Symphony Orchestra at a difficult time, so it was a big ask, because he already does and continues to do so much work for the symphony. I’m deeply appreciative that he helped me with the transition from Wildwood’s board. I was board chair under the leadership of three executive directors: Ann Chotard, Cliff Baker, and Leslie Golden. Each director faced different challenges, and each was so gifted and passionate about the organization and what it means to central Arkansas. It was great to support each of these creative leaders. I’m excited to watch Bevan Keating take on the executive director role. He’s directed me on stage, and he clearly also has that passion for the performing arts and a desire to express himself through the arts. He is driven and clear, and effective at communicating his vision, which is what we need to evolve Wildwood toward a healthy and vibrant future. Wildwood clearly means a great deal to you. What do you think the park offers to west Little Rock? Our creative arts give us the language of peace and understanding; they are the way we express our humanity. When we lose these expressions, we become isolated, harder, crueler as people. We lose an opportunity for open dialogue, which is critical to the evolution of our communities. In addition, the creative arts are a major driver in our state economy. The research is extremely clear: we cannot attract and retain young talented people into the business world — or attract businesses to come here — without these resources. I know this is true because it’s been true for my own family. Wildwood was integral to my children’s development. They were cast in shows because I brought them to the opera theatre with me; they were enrolled in opera camps. As a result, they learned to play instruments in elementary school, and as adults, they have a broad appreciation of a wide range of arts. 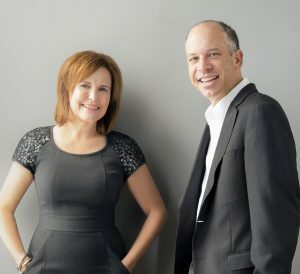 They’re both introverts, but because of their arts experience, they are extremely comfortable giving presentations and comporting themselves professionally, and this is as valuable a part of their education as any other. These opportunities help you learn who you are. And they’ve developed a vocabulary of arts and music that helps them understand the modern world. They’re not stage artists, but they are the next generation of arts supporters. This is why I see the Wildwood Academy of Music and the Arts (WAMA) as central to the park’s mission. Lives will be altered because the students who participate get the opportunity to have a violin placed in their hands. When you encourage writing, poetry, song, expressing through an instrument, you’re teaching children how to voice and process emotions. They don’t have to act out in a nonproductive way if they have this channel for self-expression. Children in central Arkansas, regardless of background, deserve this opportunity to explore creative expression through the arts. It’s a basic developmental right and need. I’m also encouraged to see that with Praeclara, Wildwood once again has a performing group in residence, which brings additional vitality to the park. The blending and range of arts forms that you see at Wildwood is something you can’t get anywhere else. These art forms are precious, costly, and easy to lose. It’s so important to preserve them, and so important for patrons to understand the value of supporting the arts. H.M.S. Pinafore will be performed April 12 and 13 at 7:30 p.m. and April 14 at 3:00 p.m. at Wildwood Park for the Arts. Purchase tickets at the Wildwood Park website, or call the box office at 501-821-7275.